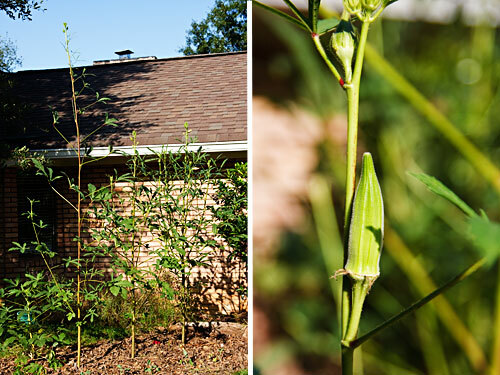 One of them is at least 16 feet tall; to pick the okra at the top, I have to grab the stalk and bend the whole plant over. From these four plants, one of which is a dwarf variety, I gather about ten pods a day, which I save up until I have enough for roasting or gumbo. If I skip picking them for even one day, the pods grow to five or six inches in length and become too tough to be good to eat. Recently, I left them unpicked for two days and when I harvested the ten overgrown pods, they alone weighed almost a pound. Interesting, yes, but inedible. With so much okra to use up, we’ve been enjoying a lot of vegan gumbo lately, with different ingredients depending on what’s the the refrigerator. Yesterday I got a craving for sweet potatoes and decided to create a gumbo to fit my mood, with tender chunks of sweet potatoes and enriched with a secret ingredient: peanut butter. Using peanut butter in gumbo may sound a little strange until you consider that gumbo, which gets its name from the Bantu word for okra, is similar to and probably descended from stews common in West Africa, where peanuts are a staple. 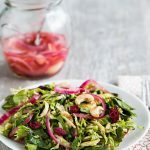 The one tablespoon I used here contributes just a subtle flavor, but it’s enough to make this one of my husband’s and my favorite gumbos. Peanut butter is the secret ingredient here; it really elevates the gumbo to something special. Leave it out only if you absolutely have to avoid the approximately 1.3 grams of fat it provides. To deepen the flavor without making a roux, I cook the onions until they begin to caramelize. A pinch of baking soda speeds up this process. Heat a large pot. Add the onions and a pinch of baking soda (optional but speeds browning). Cook, stirring, until onions brown, adding water by the teaspoon if needed to prevent sticking. Add the pepper, celery, and garlic and cook for 2 more minutes. Add 7 cups water or vegetable broth and tomatoes, stirring to combine. Then add all the remaining ingredients except the liquid smoke and peanut butter. Simmer uncovered until sweet potatoes are tender and just close to falling apart, at least an hour to give flavors a chance to mingle, adding extra water or broth if needed. Just before serving, stir in the liquid smoke and peanut butter (it helps if you mix the peanut butter with a couple tablespoons of the hot broth first). Remove bay leaves and serve over rice. Thanks, Susan. I made this tonight and it was delicious! Even though I’m up here in Boston, I’ve always loved okra, so a gumbo recipe from a native Louisianan is a real treat. Tell me though, is authentic gumbo considered more of a soup or a stew? I think I have a tendency to “stew-i-fy” things that are meant to be soups. I think of gumbo as more of a soup than a stew–higher broth to “solid” ingredients ratio. I hesitated to leave a comment, but I’m wondering if I did something wrong. 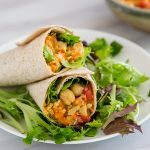 I have made many delicious recipes from this site, but this one flopped! I followed the instructions faithfully, down to to the pinch of baking soda, and it was just VERY watery. Not a “gumbo” at all, but just a brothy soup. Also it made waaaay more than 6 servings. 4 of us ate BIG bowls of it, and there was a ton leftover. I’m wondering now if I measured the broth/water (I used half and half) wrong? The only added liquid was, I did not drain the tomatoes, and I whirled them through the blender because I don’t like chunks of tomato in soups. I’m sorry it didn’t turn out well for you, Nanci! The only thing I can think of is did you cover the pot? I leave the pot uncovered, so much of the liquid boils off (I often have to add more). I’m looking at the recipe and see I didn’t specify that in the instructions. Sorry about that! I hope you find some way to make it better–maybe add some more vegetables to it. 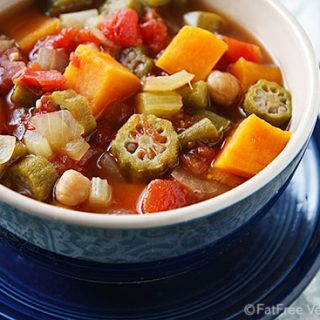 Dear Ms. Voisin: I just discovered your wonderful website, and would very much like to try your sweet potato/okra/chickpea gumbo using a pressure cooker. As I’m a bit new at this, could I impose on you to recommend any modifications to the recipe ingredient amounts (less water, maybe?) you might consider appropriate, as well as a cooking time? I would be using cooked garbanzos. Mike, you can probably do this in 5 minutes in the pressure cooker, but you will need less water (maybe 6 cups instead of 8). I’m not sure if that will be enough time to develop the flavors, but it will overcook if you give it more time than that. Thank you for your advice, Susan. Perhaps I should just skip the pressure cooker and take the long way home. Just wanted to say I love your blog and make your recipes often. I made this one a long time ago and remember loving it. However, I made it tonight and I found that 8 cups of broth is wayyyy too much. Maybe 4 cups would work. Did anyone else find this? Mine didn’t look like the picture at all. It was very brothy instead of stewy. It was a quick fix, though. I strained out the chunky soup and then poured the rest of the broth back into my vegetable broth carton. I did notice it to be rather soupy, but then (afterwards) I noticed where Susan later commented that she cooked with the top off, thus allowing much of the water to escape. Next time, I’ll probably reduce the liquid if I choose to cook without a top, but it actually didn’t bother me much. Served over rice, it turned out more like a stew. It’s supposed to be somewhat soupy because you serve it over rice, but I cook it uncovered and sometimes even add water as it cooks. Oh my, Mrs. V., this is delicious! I don’t think I’ve ever had an “authentic” gumbo, so the distinct peanut taste is new to me, but one which I absolutely love! 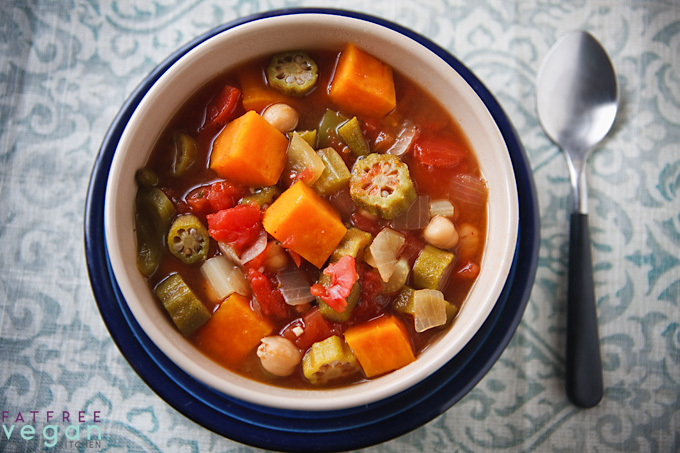 I used this as a late-summer one-pot meal (as I had a lot of garden-grown okra given to me by a friend), and I am so happy I did. Definitely will be making this again. 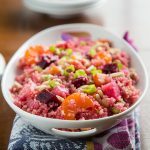 Easy, relatively quick, and so very yummy. I added a little more hot pepper sauce for a bigger kick, but no other changes. This is amazing! 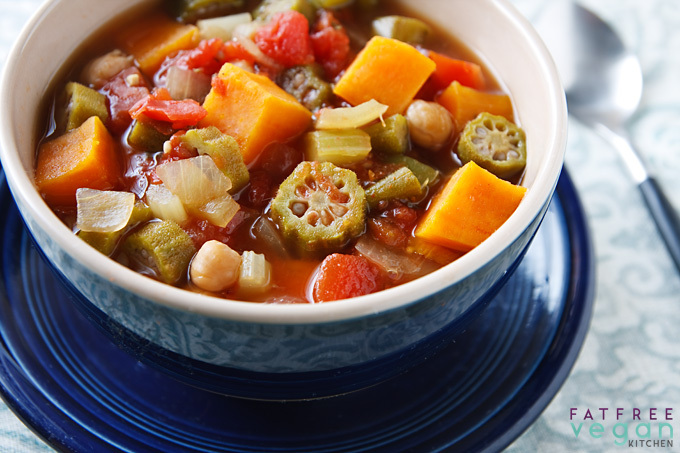 I was at a loss for what to do with all the okra and sweet potatoes in from our CSA. I made a few improvised adjustments based on what I had on hand at the moment (used red bell pepper, didn’t have celery or liquid smoke or bay leaves on hand, used some tomato sauce instead of tomatoes). My husband enjoyed it as well and has already asked for me to make it again! I have used many of your recipes in the past and just stumbled upon this recipe by accident. 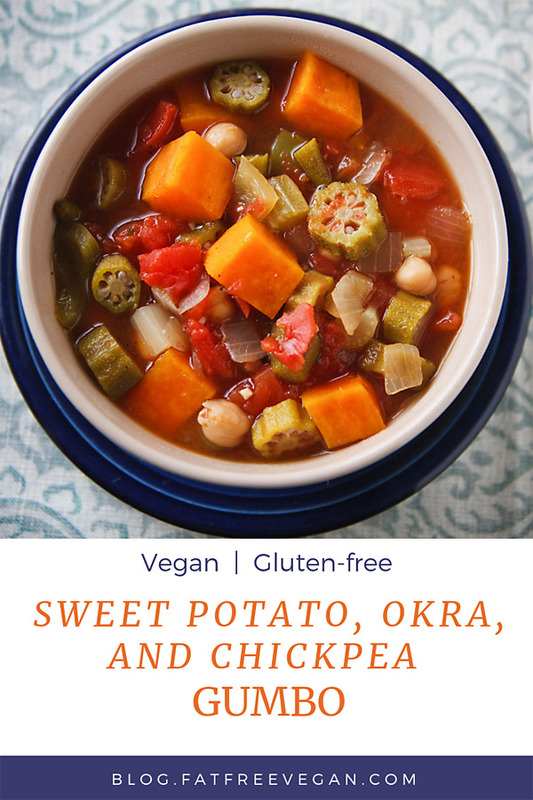 I happened to also have some okra and decided to try this, as I always have difficulty trying to figure out what to do with okra! It was delicious and everyone in my family loved it and had second and third helpings! (: I made one addition: stirred in about a 1/4-1/2 cup of pumpkin puree, to use up the last batch I made. I couldn’t detect the taste and no one else did either. I found it made the soup a little creamier. Made this tonight with fresh okra I picked up at the farmers market. OH MY GOSH. It’s delicious! I love the combination of smoked paprika, liquid smoke and peanut butter. <3 Thanks for sharing! This was delish!!! The only thing I added was parsley, 1/2 tsp soy sauce, and maybe a tablespoon Worcestershire. . 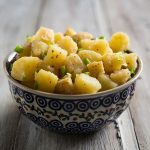 I will definitely make this again but I would probably use regular white potatoe, and maybe add half the chickpea and substitute corn for the other half of the chickpea. Spices were spot on!!! Sure. You can also just leave it out. This has become a go-to recipe for me. I make it a couple times a month. I recently stumbled upon a tasty variation. I had some Poblano peppers that needed to be used up, so I used them to make this recipe and I liked it so much that I use them to make it all the time now. Thanks for the great recipes. Keep posting.